Hisses, gurgles, growls and other beastly noises are greeting visitors to City Hall Park these days. Fearsome though these utterances may seem, they are the life-sustaining sounds of breath. 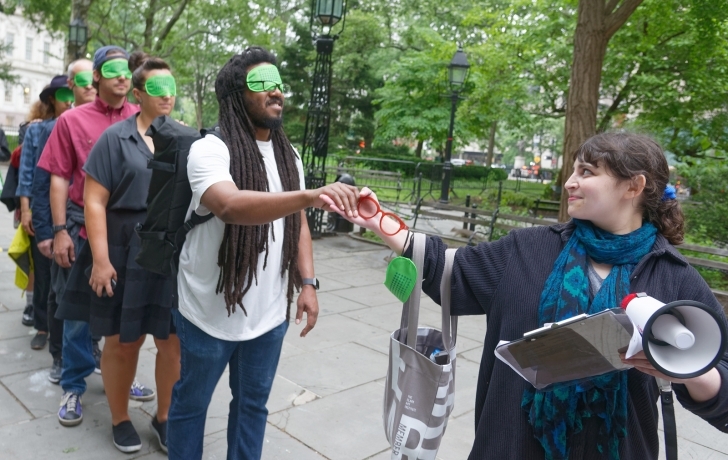 “Out of Thin Air” is a new sound installation, through July 8, by Brooklyn-based artist Sari Carel that features the recorded breathing of dozens of people, many with obstructive lung diseases. These sounds (some recorded internally with a digital stethoscope) are not only unfamiliar, but often unsettling. “I’m sure this is catching a lot of regular Downtown workers a little off guard and I think that that’s great,” said Jennifer Lantzas, the city Parks Department’s public art coordinator who selected the work. The project is sponsored by the non-profit organization More Art. The recordings, three 16-minute programs that loop every half hour, come from six speakers on lampposts above the walkway north of the park fountain. Recorded by sound engineer Kerry Pompeo, they grew out of workshops with people who suffer from breathing problems, as well as other volunteers. A doctor also supplied recordings. “Being blindfolded and walking around New York City don’t necessarily go hand in hand,” she noted with a laugh. Carel dedicated the installation to her sister, Havi, a philosopher who at 35 was diagnosed with a rare and incurable lung disease and has since written extensively on illness. “I am in awe of her resilience and incredibly inspiring body of work that she has generated in response to her life-altering experience,” Carel said. Additional public programming and other information about “Out of Thin Air” can be found at moreart.org/projects/out-of-thin-air/.